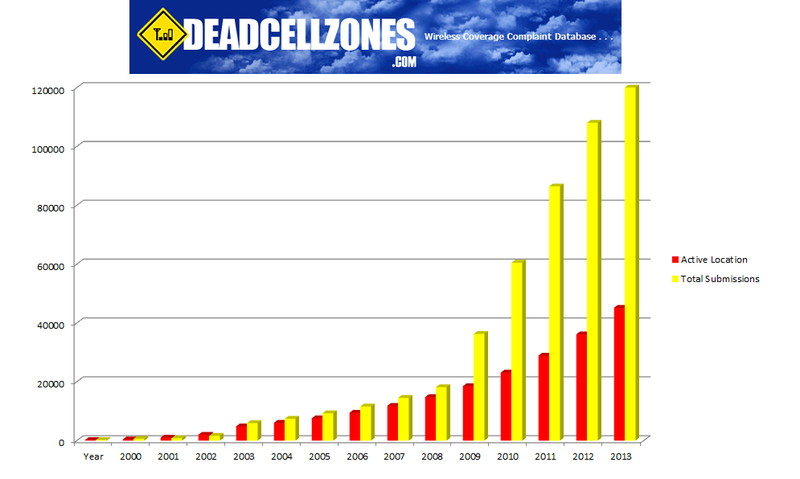 Here is a chart graph showing our dead zone database growth and current active locations in red over the last 14 years. We have had over 120,000 complaints submitted to our map. We try and remove older locations and remove locations that were submitted prior to 3 or 4 years ago. Carriers tend to upgrade networks and fix dead zones but this does not always fix the problem. Carriers can also create new dead zones while upgrading networks depending on how new your phone is. For example, many customers who once had good 2G coverage may no longer have coverage if 4G LTE as been upgrade on this tower.